Gretta Harley is a composer and performer working in several modalities including concert music, theater, rock,movement, and visual art. She is a faculty member in the music and theater departments at Cornish College of the Arts. In addition to writing music for dozens of plays at Cornish, Gretta has composed music and musical directed for: Intiman Theatre, UMO Ensemble, Seattle Shakespeare Company, Wooden O, Tribes Project, and Hugo House. She has performed in numerous bands both regionally and nationally; appeared on several recordings; film and TV. She is a co-founder of the community organization, Home Alive, and producer of its first CD on SONY Records. Gretta has designed and taught music programs at Experience Music Project, Boys and Girls Club of America, Seattle Conservatory, First Place School and Seattle Emergency Housing. She holds a Dalcroze Teaching Certificate and is a Cornish College of the Arts alumna. 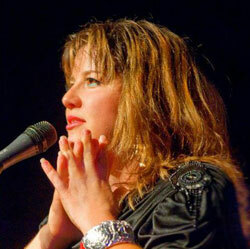 Gretta is a co-founder and performer of the rock band We Are Golden. She likes to draw comics. Named alongside legendary blues singer Ernestine Anderson as one of the two Seattle female vocalists with “pipes to die for” by Seattle Magazine Music Portfolio, Sarah Rudinoff has been singing and making theatrical mayhem in Seattle for over 15 years. Rudinoff is an actress, singer and writer who has lived and worked from New York to Los Angeles. She is known for her dynamic portrayal of characters including Yitzhak inHedwig and the Angry Inch (Re-bar), Ruth in Wonderful Town and Hildy On the Town (5th Ave Theatre), Pere Ubu in Ubu (Empty Space) and most recently Daphne Maas in the critically acclaimed new Keri Healey play Torso. Sarah has worked as an actor with local filmmakers Lynn Shelton, Dayna Hanson, Wes Hurley and Mark Price. Her solo shows have toured nationally and internationally including Broad, Go There and The Last State. Sarah has sung and performed cabaret at venues all over Seattle, including; The Triple Door, Showbox, Vito’s, Sunset Tavern and Re-bar. Sarah has sung at Les Deux Café in LA, Joe’s Pub in NYC, and opened for Kiki and Herb in Seattle. She creates original music with her band We Are Golden. Sarah was awarded The Stranger’s 2004 Genius Award in Theatre. Elizabeth Kenny has been acting professionally since 1993. She became an Artistic Associate at New City Theater in 1998, working as a generative collaborative artist under the direction of John Kazanjian. She has honed her writing and contemporary performance skills as a key collaborator, developer, and performer of new work by playwrights Kristen Kosmas and Ki Gottberg. She is an accomplished solo performer, receiving critical acclaim for Neil Labute’s Bash and Ki Gottberg’s The Compendium of Nastiness. In 2007, Elizabeth and Kristen Kosmas formed Shady Lane Productions, a theater company focused on the development of new work that is intimate, immediate, and provocative. 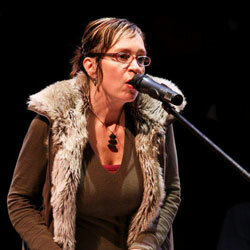 In 2011, Sick, a solo performance written and performed by Elizabeth, premiered at New City Theater. Sick and Elizabeth were honored with Gregory Award nominations for best performance, best new play and best production and she won The Gypsy Lee Rose award in excellence of production, performance and playwriting. Sick played to sold out audiences in Seattle for four months, has been touring in the USA for most of 2012 and is currently being made into a film. Elizabeth frequently speaks and leads workshops on story telling at conferences and universities.